Hurricane Harvey was a huge disaster. More than 60 people lost their lives. There is and will be hundreds of billions of dollars in damages and lost business. My deepest sympathies and concern go to all of those that will have suffered from Harvey. As a country, we now need to face how to minimize this happening in the future. Harvey hitting Houston shows us the problems the U.S. faces in the 21st century that were created in the 20th century, when reality was different. Houston is the most car centric city in the U.S., almost all ICE [Internal Combustion Engine] vehicles. All powered by the number one industry in Houston, extraction energy. Houston is one of the world capitals of the Carbon Combustion Complex economy. This is the unfortunate irony of what happened to Houston. As a city that is headquarters to major fossil fuel companies, it is the by-product of that industry, CO2, that has caused global warming and thus climate change. 90% of the warming that has occurred in the last 40 years on Earth has been absorbed by the oceans. This means that they are measurably warmer than 30-40 years ago. In addition, the warming of the planet has increase evaporation and precipitation. Harvey, and now Irma, are more powerful and bring more rain than the hurricanes of decades ago. Part of that is the warmer oceans which fuel hurricanes. So, what Houston produces has partially fueled the devastation it is now trying to recover from. Simply put, there is valid evidence that Harvey would not have caused the amount of rain has this storm occurred 20 years ago. In addition, it is the third “once in 500 years” storm to hit Houston in the last few years. Wonder why? In addition, there are so many refineries and toxic storage facilities in the Houston area because of fossil fuel production. It will be inevitable than water, land and homes will be contaminated. Toxicity is a key component of the Carbon Combustion Complex. Now the people who live in Houston may well have pollution, contamination issues and subsequent health issues in the months and years ahead. The last thing to mention about Houston is that it is not a coastal city. It is close to Galveston which is, but we have the fourth largest city in the U.S. not on a coast and suffering hundreds of billions of dollars of damages from a hurricane. This points to the real issue facing humanity and the U.S. going forward: retrofitting the current Industrial Age, extraction energy, car centric, infrastructure with ‘look the other way zoning’ to reflect the present and future realities. As written in this space, the next 25 years will be known as the Age of Intelligence and the Age of Climate Change. These two developments will shape the redefinition of “reality” more than any other two forces between now and 2040. It is time to face them and start to redesign and retrofit what we have built and accepted in the 20th century. In my 2013 book “Entering the Shift Age”, I stated that this was the first time in human history that humanity would have to retrofit the prior century. This is due to two historically unprecedented reasons. First the population quadrupled in the 20th century from 1.5 to 6 billion people. The second is that humanity, and particularly the U.S. has created a built landscape based upon the Industrial Age, fossil fuels and also institutionalized the inventions of the 20th century. The ICE was institutionalized into transportation, and sprawling, urban landscapes were created to support our car centric lifestyle. The average sea level rise in the U.S. the last century was 11 inches. The range of projections for sea level rise between now and 2040 is 2 to 4 feet in Florida and the rest of the gulf coast. What does that mean? It means that Galveston and parts of Houston will be under water in high tide and that Miami will have to be permanently evacuated, along with the rest of the southern part of Florida. We must start to face this reality; that our cities anywhere near any coast must be rapidly rethought facing the future and not just repairing and rebuilding. Why rebuild something that will only be flooded again? In the Age of Climate Change, we simply must change our thinking about the rapid conversion from extraction energy to renewable as possible. This will not really affect the next 30 years, as that much warming has been baked into the planetary system. Even if all CO2 emissions were to stop tomorrow, there would still be 20-40 years of warming and therefore possibly $1,000,000,000,000 of property and business losses in the U.S, never to be recovered, at least in this century. 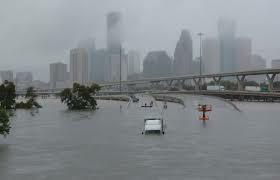 To even seriously consider ocean front development or to continue to build in ocean flood zones as Houston borders on madness, or incredible stupidity. Given the obsessively nationalistic focus of media outlets in U.S. it was not widely reported that while Harvey was causing 60 deaths and displacing hundreds of thousands of people, in Asia the unprecedented heavy monsoon season brought about 1,200+ deaths and the displacement of more than 40 million people. The common thread? Climate change and global warming. Time for humanity to wake up and face the weather and energy realities necessary to maintain civilization until 2100.